Trust me, these two will be just fine. If you’re a mainstream entertainment writer, there’s nothing which would thrill you more than to read, in Keith Richards’ new memoir Life, which releases on Tuesday and which is receiving admittedly more attention than any recent celebrity memoir, that the uncontrollable Rolling Stones guitarist has always hated and resented longtime Stones frontman Mick Jagger. Let’s be honest: it’s a much bigger story that Keith Richards doesn’t like Mick Jagger than a story about how much he loves Mick would be. The former tact is likely going to sell more books and publications containing stories about what the book will reveal. But the problem with delving and interpreting what Richards may or may not be saying about the Rolling Stones right now is that the entertainment media wants the Mick Jagger and Keith Richards union to be similar to the current Bachelor couple, or Kate Hudson and A-Rod; i.e., they want to see the sparks, because the sparks are more of a story. The truth is more likely that the relationship of Keith Richards and Mick Jagger goes way, way deeper than any story you’re going to see as a headline on Entertainment Tonight, or on the cover of Us Magazine. The duo, who is arguably the greatest collaborating couple in rock and roll history, would seem to have the same problems as any couple of buddies who’ve known each other for almost fifty years. And not only are Richards and Jagger people who’ve known each other for that long, but they’re people who’ve run a business together for that long. Of course there’s going to be dirt. 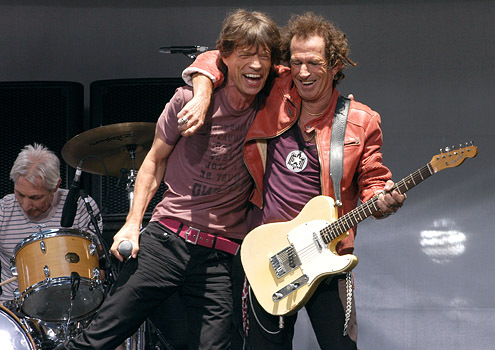 Evidence that the Richards-Jagger “rift” isn’t anything to really be worried about, as if anything has proven itself true over the last decades, it’s that these two don’t have any problems big enough to stop playing music. Because let’s face it, they’ve had plenty of opportunity to stop. Doesn’t seem like a problem to me. “We’ve had our beefs but, hey, who doesn’t?” Richards also said on Today. “You try and keep something together for 50 years.” It’s also been widely reported that Mick has read the autobiography and doesn’t have a problem with anything Keith said about him. I’ve never written a tell-all memoir, I’ll freely admit, but the last thing I’d do is hand it to someone I hated, and whom I’d just written a ton of terrible things about, to see if he was okay with everything. What Life seems to be (Rolling Stone magazine published several excerpts from several chapters in their recent issue) is the story of how a band stays together. And anyone who knows anything about rock and roll knows that it’s not always pretty, especially when the 1960’s and 1970’s are involved. Mick and Keith’s relationship can’t be compartmentalized into a “Sandra Bullock and Jesse James”-style piece. It’s not that, and it’s never been that. The media’s obsession with tearing things apart — because torn apart things make better stories — seems to be missing the mark here. The story here is how two best friends, who may have polar opposite personalities, have stayed together for so long and continued to run one of the greatest rock dynasties in history. If anything, Keith Richards’ memoir would seem to be a better self-help book on how to keep a marriage together than a tell-all attack on someone he calls his best friend. Maybe everyone’s looking at this wrong. The truth is that knowing someone for more than fifty years, doing business with that person and collaborating creatively with him for that long is bound to have shades of difference from time to time. That’s just a life truism. The fact that Richards left in all of those differences and freely admitted that he has some problems with Mick is just being honest. This doesn’t seem like a story of Keith Richards vs. Mick Jagger, despite how much that story will sell copies of the book. If Mick himself doesn’t have a problem with it, and he’s read the book, then where’s the problem? Neither Keith Richards nor Mick Jagger have ever seemed to be, nor claimed to be, perfect people. And they’ve both been in the public eye for decades. If they can somehow continue to exist together, who are we to break them up? We’re a culture obsessed with destroying anything successful and beloved, but the Richards, Jagger and the Rolling Stones has been indestructible since 1962. It’s going to take more than a few juicy, scandal-promising headlines to bring that crashing down, despite what a “great” story that would be. If anything, we could all probably take a lesson from them.